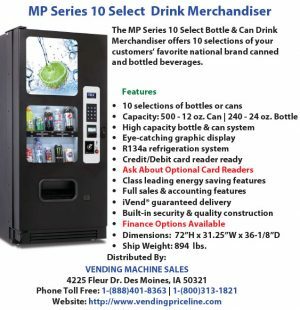 VENDING MACHINE SALES-Beat Price Increases... Save Big Now! As a Vending Operator, you can benefit by being a part of the 87 year old manufacturer of Vending Machines. As well as, we wish to sell you vending machines in the near future, at the lowest rate possible on NEW VENDING MACHINES. Sad many of our established operators are still clinging to outdated machines in their good locations. ***The larger part of our sales are from new operators looking to cash in on the new surge and boom in the economy. 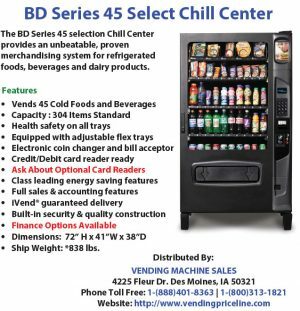 Knowing dealing with a factory direct sales group such as Vending Machine Sales offers them the best prices and life time free technical service. We have all our brochures on our website that can be down loaded, printed and dropped off at locations with outdated machines by Your employees out filling your locations vendors. At the same time they know where good locations are and just need to drop it off with your phone # to call to have this latest state of the art machine installed meets “USA Energy Star Compliant” efficient standards. credit and debit card as well as I-Vend insuring delivery or refund. Results in no out of order or refunds forgotten by employees. Results in a Win Win for the location. Go to our new website www.vendingmachinesales.com down load brochures and build your route during the best times for business in close to 50 years. Looking forward to filling your orders for the best machines for the benefit for you the Operator our #1 concern. Looking forward to helping get the best quality machine at the lowest factory direct rate! Visit our new website www.vendingmachinesales.com Our manufacturer appreciates their employees as well as Distributors and their customers. You are always #1 with both- us the Distributor, and also with the Manufacturer, who has life time free technical service on all vending machines by phone. In another few days the Wittern Group will be celebrating its 87th year in business. Very few companies have had the leadership and success to reach this goal. Pass on to rest of the employees. They can be proud of being part of the company I have been associated with for now the 30th of October 54 years. Lou Kershbaumer Vending Machine Sales. In Vending Since 1960. Proud to be a part of the Wittern family of companies. New employees and old employees, know the Wittern family appreciate your work and accomplishments as employees of the Wittern Group. It was a much smaller plant at that time. Now with the eminence growth of the company, your importance is still recognized by all the family as well as your supervisors. My brother Peter, came to the Wittern Group in 1954, he would order machines by the truck load. He got me into the vending business. He passed away in 1993. I was a competitor with the Wittern group from 1960 until 1964. When I came to Iowa in 1964 I was met by the founders, FA & Vi Wittern at gate 6 of the Airport. The dedication to myself as well as all its employees for the last 54 years has never faltered. As we celebrate the 87th year below is what was written last year that many of the employees may not have seen. As well as all our new employees. Lou Kershbaumer, Vending Machine Sales. For more information visit www.vendingmachinesales.com, Contact Lou 800-313-1821, email Lou.